It's our final day of tinkering this week and it also marks the close of our epic summer day camp in San Francisco. What better way to celebrate than to build and test ride our hamster obstacle course!? The giant hamsters ended up not joining the party today, but that was fine as we wanted to test our prototypes first to make sure they were safe for our furry friends. The hamster cart team made some final structural support additions and discovered just how bendy PVC pipe can be while making an awesome tunnel. After lunch it was finally time to test ride the cart! One of the privileges of being a collaborator is that we get to ride/test every potentially dangerous project first to ensure its safety. And this time, I was the lucky collaborator to get the job. The excitement in the room was palpable. Would the young tinkerers hard work hold up to the gravitational forces? Or would I go crashing like a tumbling hamster??? I am happy to report that I am still here report to you all (with all body parts intact) that it was a GIANT success! The kids jumped and yelled and cheered as I flew down the track ramp, across the room and smashed into our stopping barrier (metal chairs – for added drama). Everyone couldn't wait to try it themselves and show their parents. Check out the video at the end to see the fun! Meanwhile, the hamster wheel team worked hard to complete their stand, install the wheel, and test out their impressive feat of engineering! The team did an amazing job reducing friction on the axle. It actually consisted of a metal threaded rod inside a piece of metal conduit pipe. This allowed the two metal pieces to slide against each other rather than metal on wood which can cause a lot of drag. As a result, they discovered that absence of friction can also be important to account for...the wheel could spin super fast if folks weren't careful to slow it down! Check out the fun! The kids all got to ride in it – helmet required of course. The obstacle cubes were also fully covered and connected by a spooky dark tunnel. The kids made sure to add lots of trip wires, dangling obstacles to duck under, a swing, ground barriers to walk over with stilts and more! They had a blast testing out their agility maze. I hope the hamsters are prepared. One of the joys of Tinkering School is having the chance to build things bigger than ourselves – especially things that we can use and interact with. Whether its a mountain to climb over, a wheel to roll inside, a cart to ride in, or an obstacle course to traverse, there's nothing quite like getting to play with a huge creation that you also dreamed up and built with your own hands as part of a team. A big thank you (and squeak) to all our hamster tinkerers this week for bringing your imaginations, and enthusiasm, and teamwork. All of our Tinkering staff look forward to hopefully seeing many of you next summer and in lots of our other camps. Till then, happy tinkering and hamsterbunga! To see more photos from our hamster maze week, please visit our Flickr page! Luckily, we were able to spend a little more time in our morning project meetings to allow our energy levels to return again to "safe" tinkering levels, and then finally it was time to build! The cube team continued to build their walls, fine tune their swing, build a roof, and install the first obstacles. So much activity! The climbing challenge team installed the rock climbing wall as well as the rope pull wall. After a successful test from our staff collaborators, the tinkerers had their chance to climb up and over. Some of the youngsters were scared of the height at first, but after taking their time to slowly navigate the obstacle, their faces lit up with excitement "we did it!." A ladder? A bridge? A collaborator catcher? When tinkering, a few sticks of wood can become anything! The crew also took advantage of the final painting day – we had to make sure everything dries before Friday when the parents arrive! The stilts team made some nice modifications too, adding some metal handles. They learned how to use the drill press to bore large holes for the hardware to fit into. The hamster cart team tested out their platform, ramp, and cart. While I walked around on the platform and ramp, the kids all watched and listened for signs of cracking, creaking, breaks, bends or any other troubling sings of structural weakness. We discovered a few spots that could use more supports. Good thing we checked! We also tried out the cart to see how it rolled. It picked up some speed! It will be an exciting ride when its all ready to go. The hamster wheel team is also nearly done with the wheel portion! The floor boards are being installed and now its time to work on the support stand. Can't wait to see it rolling along! At least it is was here today at our San Francisco day camp! We had lots of fun busily tinkering and building our epic mazes and obstacle courses. We have a new hamster friend who just joined the team! We are not yet decided on what their name is yet... we'll keep you posted. The huge rope climbing wall was ready to be raised. Hopefully the hamsters will be ready – this is looking like it will be a super challenging maze / obstacle course! The rock hand holds for the climbing wall were carefully placed and bolted on to a piece of plywood. What will these climbing walls be attached to you might be wondering? Another group completed an impressive 7 foot tall tower, utilizing many triangle supports to make sure it was super strong. It will securely anchor both climbing walls and serve as an excellent hamster lookout post. Our collaborators always test the structural integrity of pieces that will be holding weight. Two thumbs up - the platform was really sturdy! The large hamster cart received some much needed safety upgrades. Walls and bumpers! Meanwhile, the track team worked super hard to build a launch platform and ramp. This team demonstrated some impressive collaboration, all deciding together how to share drilling, screwing, and holding duties. There's so much we can accomplish when we work together! One cart and track was definitely not enough. Our hamsters enjoy riding in style, so this team prototyped and built another really cool train system. Yet another hardworking group of tinkerers made huge progress on their hamster wheel. Cutting the axle with a hacksaw. They learned how to use the drill press to cut out holes in the cross supports that will hold the axle. One of the obstacle cube teams made tons of progress sheathing the sides with thin plywood. The bandsaw was another tool they learned how to use. It's great for cutting plywood. Similar to the chop saw, it also has a "blood bubble" that we keep all our fingers and out hands out of. Jack tested out his stilts too and they worked like a charm! Super stable and easy to control. We have an incredibly enthusiastic and hard working group this week. The obstacles are taking shape, the projects are growing exponentially, and the hamsters hopefully are busy prepping, because they are going to get a workout navigating this maze! Check back soon to follow this crews progress and to see more photos from the week, please do visit our Flickr page! The hamsters are going to be veeerry happy! We had a full day of tinkering and building today and we saw lots of collaboration and hard work and these projects are already growing to be bigger than ourselves. One team focused on making two giant boxes that will be connected by a rope swing and filled with obstacles. Hopefully the hamsters are super agile! Sometimes hand tools are the right fit for the job! The kids love hand saws almost as much as they love using the chop saw. There is something so satisfying about using just your strength and a piece of metal to mold the world around you. So many opportunities for teamwork! Another team worked hard on building a cart and track for our lucky hamsters. Safety first! It was decided by the group that adding a bumper to the hamster cart would be a good idea. Xenia happily took on the task of adapting an old tire for the purpose. What would a giant hamster week be without hamsters! Another team gleefully began work on creating some cute, huge hamsters. There were some tricky angles angle pieces to cut and attach that definitely gave these young tinkerers a chance to try harder than usual. 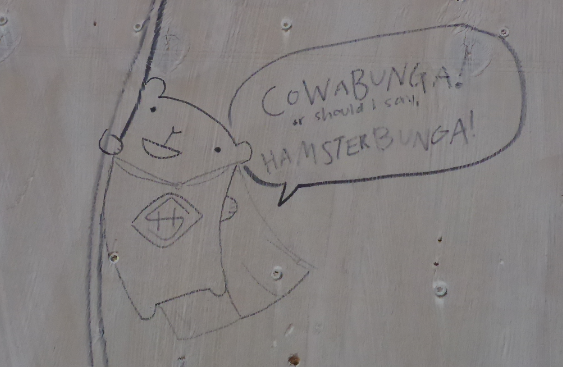 What would a hamster maze be without a climbing wall! This team is really excited to construct a 5 foot tall climbing wall that will lead to a platform and ramp. The hamsters are going to get some serious excercise navigating this maze! There's even going to be a section of the obstacle course that requires stilts! We discovered the usefulness of triangles (gussets) to make really strong connections between two pieces of wood. I never thought hamster envy could be a thing, but after seeing the creative projects this hard working group is putting together, I'm starting to think more and more how fun it would be to traverse this epic obstacle course! Stay tuned for more tinkering and check out all the fun from the week on our Flickr page! Have you heard the news!? Hamster pet food across the country has been found to have traces of super ginormous growth hormone accidentally added to it...and the result...??? GIANT HAMSTERS! they're still cuddly and cute, but now they're giant - roughly small human sized. 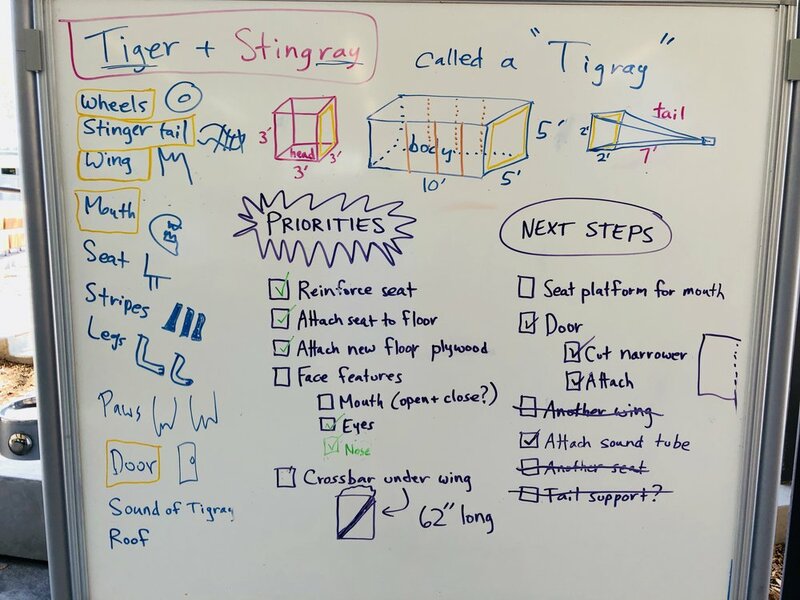 Luckily our newest group of tinkerers joined us this week and we're on a mission to build some new and enlarged hamster mazes for them so they can feel at home again soon. Before we could get started building though, we needed to create some group agreements: How do we want to treat each other? How do we plan to stay safe while we build? We came up with a great list that we all felt good about and then it was on to tool training! Our young tinkerers learned how to efficiently clamp multiple pieces of wood together. Many multiples! They built some impressive clamp bridges with their new skills and then learned how to carefully take them all apart in reverse order. Knowing how to use a drill is an essential skill for a tinkerer to have in their toolbelt, so we made sure that everyone had an opportunity to practice their drilling technique. Always a favorite, the kids learned to use the CHOP SAW!!! Its the most exciting and potentially dangerous tool we frequently use in the shop, so we have developed very specific safety protocols that each kid learns and every cut that is made through the week is supervised by one of our staff collaborators. Manny (E-man) explaining the "thumbs up" check that the chop saw operator needs to get from everyone nearby before making a cut. 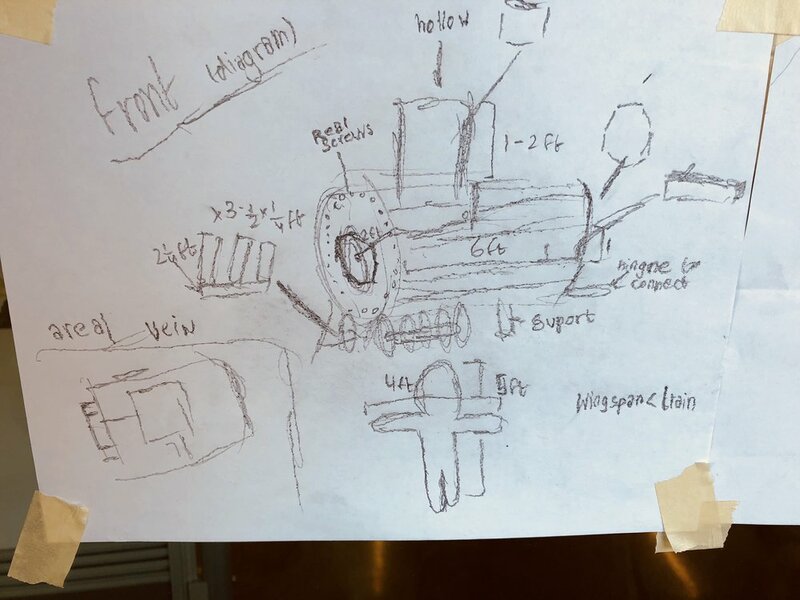 After our lunch break the kids discovered what the weeks' tinkering theme would be and then dove into brainstorming and designing their projects. There's some super fun ideas being developed and I have no doubt the hamsters will be deeply appreciative of their efforts! There was even still time at the end of the day to begin building! – lots of measuring, cutting, and material gathering. It's going to be a very productive week I have a feeling. We ended the day with a closing circle where we listened to each other describe how we tried harder than usual, collaborated with friends, and made some great mistakes that we learned from. Looking around at the projects, it was also clear that we are already well on the way to building projects bigger than ourselves. The kids are eagerly on board with our four tinkering school goals, and it will be exciting to watch them tinker this week. Who knows what amazing creations will come from their collaborations. The hamsters can hardly wait! To see more of the tinkering fun today, be sure to visit our Flickr page! The tinkerers certainly did accomplish all of the four goals we set out to accomplish! By the time Friday afternoon rolled around, we had a giant human body cell, a climbable huge "dragon-cell" full of viruses that they could launch at the human body cell, and a huge immune system cell that was prepared to protect the human body cell from the viruses. While these structures were not completely accurate scale models of the way our human immune systems protect us from viruses, it was one way of engaging young tinkerers in biochemical learning at a young age. The virus group learned about the influenza virus (among others) and the different surface molecules that facilitate the virus entering or exiting a cell. The human body cell group learned a little about cell movement and also cell membranes and how things are transported across a membrane. While the immune cell group learned some about how our human immune systems create antibodies for the microbes to which we are exposed so that we can fight them when we are exposed to them again in the future. It was a fun and engaging way to expose tinkerers to some advanced science learning at an early age! As collaborators, we also wondered how an all-girls group of tinkerers would take on modeling an "attack" or a "battle" scenario. As humans, we often frame the viruses as the aggressor to be fought off in order to protect our own human cells. On Monday, without having been offered another narrative or way to frame the scenario, the girls in the immune cell group had already begun tossing around ideas for sorting the viruses they captured into "good viruses" and "bad viruses" as they explored their own concept that maybe not all viruses are bad and that some might be good and useful - already they were looking at the traditional narrative from other angles and through lenses of empathy! It was a fun and meaningful part of All Girls Week to talk with the female tinkerers about how stories with a "villain" and "hero" from one perspective can be viewed entirely differently from other perspectives. Be sure to stay tuned to our blog next week for another great week of Tinkering School Day Camp adventures! As always, you can find many more photos from All Girls Week on our Flickr Photo Page by clicking HERE. The last day of camp arrived with a flutter of nervous excitement. Would we be able to finish our builds by the afternoon? Would the train be able to pull the passenger car? Would the hidden door be reinforced to allow it to properly raise and lower? The answers came in spurts: yes. yes. yes. Even though there is always more that can be imagined, more that can be designed, and more that can be built, we know we have a deadline and we work as a team to do as much as we can in the time we have. 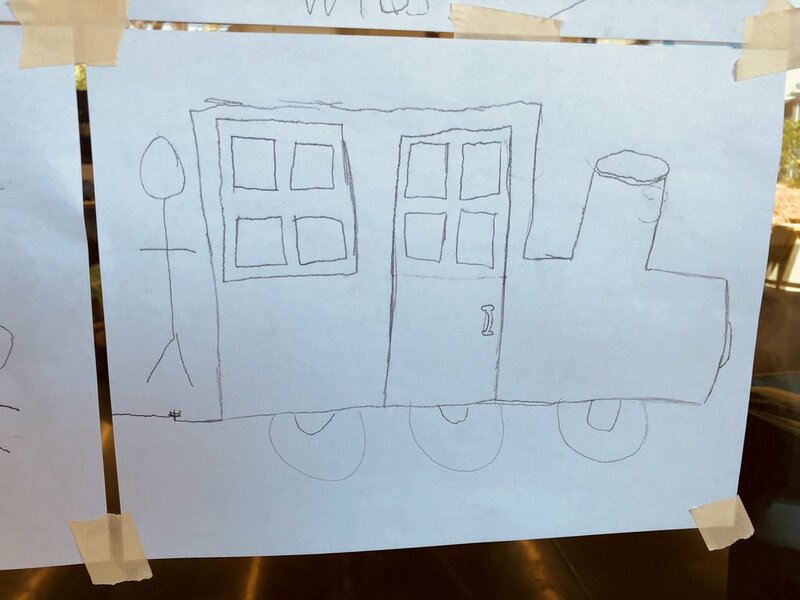 The tinkerers met to plan how the train would arrive, how many people could ride it at one time, how best to allow visitors to travel under the hidden door, and where to position the sink and basilisk. During our closing circle, just before family members arrived, we said more gratitudes to each other and shared ways we had met our goals for the week. There were new friendships growing and thanks said for help given. At the end of the day, we all pitched in (thanks, family members!) to take apart our creations and return all of the materials to their original bins so they could be used again another time. And so it is bittersweet that the final week of Tinkering School Summer Camp at Mark Day School comes to an end. We hope to see each of your children again next summer for another exciting program! For many more photos from the week, visit our Flickr page. Click through the slideshow below for many more photos from today. Today felt a bit like running full speed toward platform nine and three-quarters, believing with all our heart that the platform would appear just in time! We had so much to do, so many projects yet to be completed, it seemed impossible, but with a lot of teamwork, a few moments of frustration, a break for popsicles and a few compromises, we made major progress. During a break, we reminded everyone that our goals for the week never included finishing. They were to Collaborate and make friends, try harder that usual, build something bigger than ourselves, and make mistakes we learn from. That's it. Completing projects is just a bonus. We hope to see you at 2:15 tomorrow for the unveil! After that the tinkerers will get to demonstrate their skills with the drills as we take everything apart. Adults are invited to help keep things safe, carry materials back to their places and generally admire the effort of your young maker. It has been an incredible week! "A scarlet steam engine was waiting next to a platform packed with people. A sign overhead said Hogwarts Express, 11 o'clock. Harry looked behind him and saw a wrought-iron archway where the ticket box had been, with the words Platform Nine and Three-Quarters on it. He had done it." "Of the many fearsome beasts and monsters that roam our land, there is none more curious... than the Basilisk, known also as the King of Serpents. This snake, which may reach gigantic size, and live many hundreds of years, is born from a chicken's egg, hatched beneath a toad." I read longer versions of these passages to our tinkerers during our after-lunch circle to further inspire them (and to take advantage of the air conditioning), although I don't think they need much more inspiration based on the creative sketches they've made on whiteboards and the mathematics- and physics-based contemplation happening in conversations. This morning, students rotated through three mechanical engineering workshops to learn about pulleys, levers, and structural reinforcement (hint: ask them which shape is the strongest). We're continuing to think about which part of our builds might move and how we might accomplish that. It was a full day of building and at the end of the day, though we were hot and somewhat tired, we shared stories of ways that other tinkerers had helped us (carrying wood, partner pushing on a drill, etc.). Visit our Flickr page for even more photos from today and the rest of the week. Feeling the difference between lifting 12 pounds using a single pulley, two pulleys, and four pulleys. Testing how being closer or further from the fulcrum affects lifting strength. Avi brought his own copy! Learning to add a gusset to wobbly table legs in order to strengthen them. The engine cab is taking shape. Jig sawed circles of plywood and chop sawed 2x4s are connected to form the front of the engine. 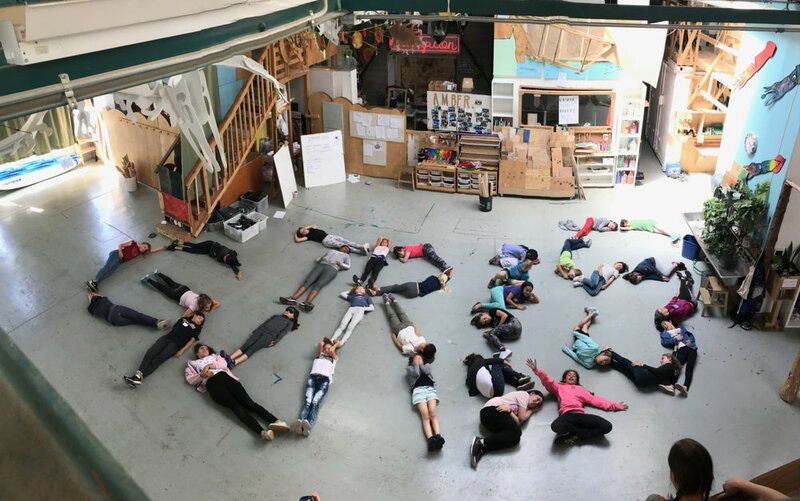 "Make Mistakes and Learn From Them"
This is one of our four Tinkering School SF Day Camp goals and we work hard to create a failure-positive learning environment at camp. When a tinkerer makes a mistake, often their first reaction is shame, embarrassment, or frustration. In these moments we make a point to pause and celebrate the mistake! We take photos and examine what happened. Then we talk about what we can learn from the mistake. During our closing circle, we often talk about the mistakes we made and what we learned to share the knowledge with others and to create a community where making mistakes is an emotionally safe and joyful thing. Mistake: The drill won't go into the wood. Learned: Make sure the drill is not in reverse! Mistake: The screw became stripped. Learned: With use over time some screws get stripped. Put pressure on the drill to avoid stripping a screw. Don't try to use stripped screws! Mistake: The chop saw blade hit a knot, split off a chunk of wood and tossed it off the saw! Mistake: The drill bit broke off in the piece of wood! Learned: Be sure to keep the drill straight when drilling. The bit can break in the wood. Mistake: The safety glasses we stepped on and snapped in half! Learned: Keep safety glasses off the ground - on the face is the best place. Let's here it for making mistakes and learning from them! Today was the first full day of building at Tinkering School Day Camp SF and the building was buzzing with collaboration, building and tinkering! What is it like tinkering, collaborating and building with all girls? Be sure to check out more photos on our Flickr Photo Site by clicking HERE! We could feel the excitement in the air today even before camp started. Everyone just wanted to get building! Before we could build bigger than ourselves though, we needed to talk about carrying wood safely in a bustling construction zone. Once that discussion was had, tinkerers either went full steam ahead on The Hogwarts Express, or dove headlong into the Chamber of Secrets. Each day brings an opportunity to use the tools we learned about during Monday's tool training and to use new tools as well. Today's tools included a jig saw - great for cutting straight and curved lines in plywood - and a Sawzall - useful for cutting wood that is already connected to a frame and can't easily be moved onto sawhorses. The heat made it easy to meet one of our goals, which is to try harder than usual... we used a break after lunch to cool off and reflect on what tinkering is and why we do it. It was an informative time, and many of the thoughts captured during that time highlighted the reason we do this work. Check out even more photos from today and the whole week on our Flickr page. The base of the train is taking shape. Using the Sawzall to trim part of the train base. The basilisk body has several segments. Small groups are working together to build each one. It takes several steps to be ready to use the jigsaw: measure and draw lines, clamp wood to sawhorse, put on ear protection and goggles, "is everybody ready?" safety call, and then it's time to cut. Assembly square + clamp + a partner to hold the wood = successful drilling. 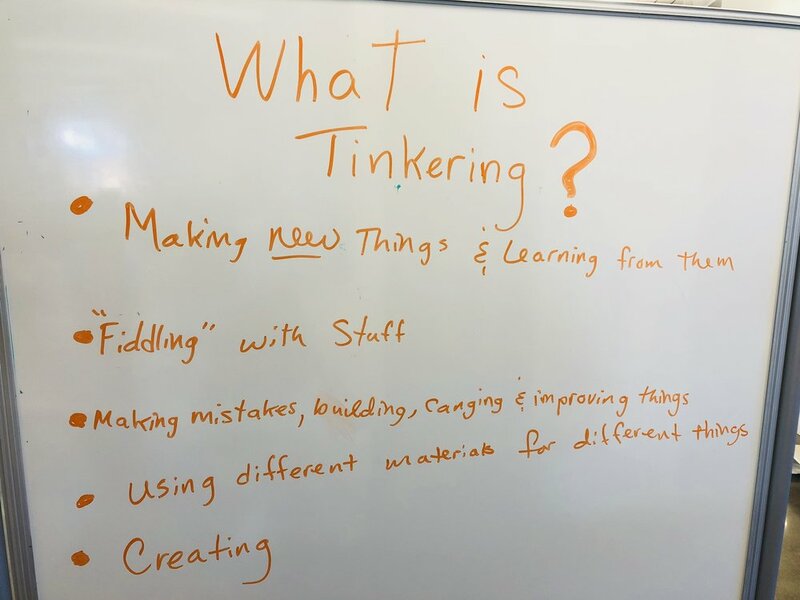 Individual student response to "What is tinkering?" and "Why do we tinker?" Sometimes a "partner push" is just what's needed to add enough pressure to the drill. Click through the slideshow below for more photos. Week 4 of Tinkering School Day Camp SF has begun! This is an extra special week because it is the one week of the summer where all of our campers are children who identify as girls. We call it "All Girls Week". Even all of our collaborators are female this week - our male staff are helping out at Overnight Camp. This morning we started by making our group agreements for how to treat each other and work together safely. In addition to the regular agreements that we tend to see week to week (for example, "Always walk" and, "Treat others the way THEY want to be treated") the tinkerers also came up with some other thoughtful agreements including, "Don't yuck someone else's yum" and "Be kind about other people's ideas." After a mid-day break of playing in the park and having lunch, the tinkerers returned to the building for the big reveal of the secret theme for this week .... VIRUS! At first they were confused. "Wait... virus?..." We took a few minutes to talk about what human bodies are made of, what a cell is, how our bodies get sick and what makes them sick, and how our immune systems work to keep us healthy. Come back to our blog this week to learn how Virus! Week goes with our tinkering girls, and be sure to check our Flickr Photo Site for many more photos from this week! Gryffindor. Hufflepuff. Ravenclaw. Slytherin. Magic has arrived at Tinkering School and the tinkerers are no longer muggles, having learned the art of tools. We started the day discussing our goals for the week and then met to talk about group agreements in order to set a framework for ways that we interact with each other and with the tools (e.g. "treat others the way they want to be treated."). Every tinkerer went through tool training to learn about and practice using clamps, cordless drills, and a chop saw. In the afternoon, we split into our build groups to work on designing the two projects for the week: The Hogwarts Express train and the Chamber of Secrets. If you're wondering whether Moaning Myrtle will make an appearance, join us for the big reveal at the end of the week! Check out more photos from today on our Flickr page. Check out the many more photos of this week of camp on our Flickr page - HERE!